The spiral is an ubiquitous shape in nature. Everyone is familiar with the spiral pattern of a sea shell, or the whirling flow of water as it goes down a drain, or the spiral shape of distant galaxies. Those who appreciate the beauty of these objects can add a new one to their lists: spirals around stars. Our team at the Space Sciences Laboratory at U.C. Berkeley reported this latest addition to the cosmic menagerie in a letter in the April 8, 1999 issue of Nature. These results are further described in our letter in Nature "A dusty pinwheel nebula around the massive star wr104" by Peter Tuthill, John Monnier and William Danchi Volume 398, pp. 487-489, April 8, 1999. A preprint is available to download if you are interested in learning about the details of this work. 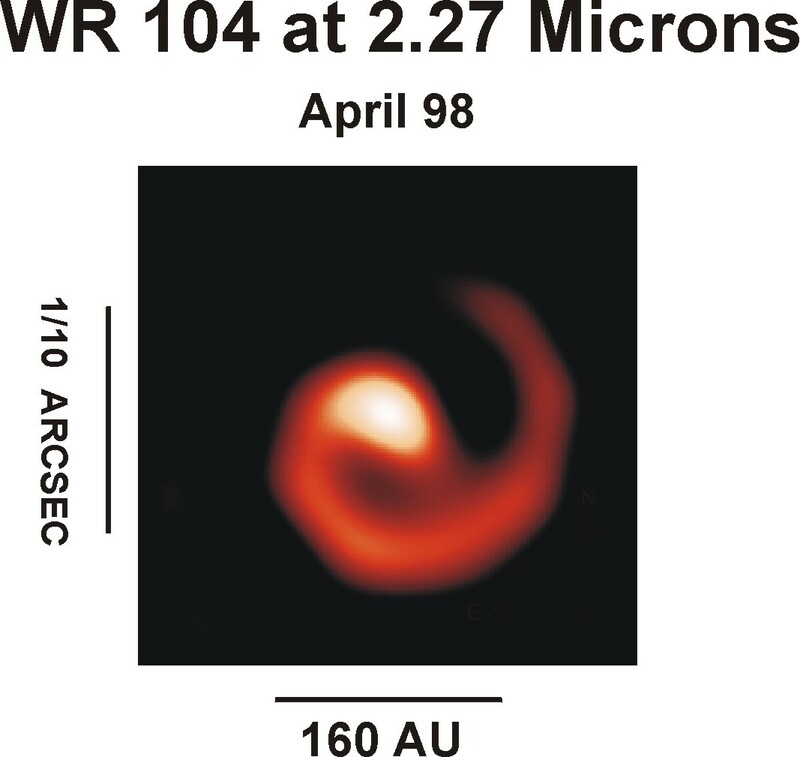 More recently, we have been studying a second Wolf-Rayet star known as WR 98a. As it is not as bright as WR 104, it was more difficult to make images with our high-resolution techniques. Despite this, we have seen this star also has a spiral outflow tail, and we have made a movie showing its motion, which is displayed to the right. The extra lumps and irregularities in the map are partly due to the lower quality data. This system is not quite as close to being face-on in viewing angle to the Earth. You can see this from the more elliptical shape of the tail as it curves away from the bright core. The 1.5 year period of rotation for WR 98a is longer than for WR 104, and interestingly in this case, it corresponds almost exactly to a previously-seen regular dimming and brightening. There might be two reasons for this variability, or (as Astronomers call it) lightcurve of WR 98a. Firstly, more or less dust might be formed at different sectors as the binary star goes about its orbit. This would be likely if the orbit of the stars was not circular, but somewhat elliptical (as is the orbit of the Earth around the Sun, for example). A second reason might simply be due to our viewing angle. During certain parts of the orbit, our view of the hot inner parts might be blocked by dust, resulting in a variation in the lightcurve. With two separate objects both exhibiting similar characteristics, we have established that the pinwheel nebulae are a class of object, not an isolated case. We hope that there might be even more of these rare exotic spirals, twirling out there in the night sky, waiting to be discovered. Click Here for a preprint of the WR 98a paper, published in the Astrophysical Journal Letters 1999, 525, L97. For more information about other exciting research in the field of stellar interferometry, please see the SUSI interferometer web page; the Infrared Spatial Interferometer Group, at Space Sciences Laboratory, U.C. Berkeley or the Infrared Optical Telescpe Array on Mt Hopkins, Arizona. This research was supported by grants from the National Science Foundation Stellar Astronomy and Astrophysics Program.